This Fire Festival, Lughnasad, is traditionally celebrated at the hottest time of the year, 2nd.February here in the Southern Hemisphere. Lughnasad is the feast of the Celtic God Lugh, who gave his name to the city of London. It marks the Harvest of the cereal crops, which is earlier than that of the autumn fruits and vegetables. It later became the Christian Lammas or Loaf-mass, offerings being made of the first loaf baked and the first ale brewed from this year's crop. The Anglo-Saxons called it Thing-tide - the Thing being a kind of planning meeting, presumably to assess the extent of the food available for the coming winter, and plan for the community accordingly. Bread and ale were the staples of the Northern European diet. While wheat was much prized, both were usually made from barley, which was a much more reliable crop. Even mixed with wheat, it makes a much heavier bread. But we would hardly recognise the heavy, well-baked stuff, our European ancestors knew as the staff of life. Much of each baking was allowed to go hard so it would keep, and was then dipped in ale or milk to soften it again. Ale, too, was very different then, being sweet and nutritious, with poor keeping qualities. Many indigenous beers are still being made, and are similar. Hops, which act as a preservative as well as bitters, are a comparatively recent addition to brewing, and they are what distinguishes beer from a true ale. South Australia is renowned for its barley, and now supplies much of the world's best quality malting grain. For a good beer or ale still starts with barley. And the Harvest is just now coming to an end, so the timing of the Festival is perfect. Click the picture above to learn more about Medieval ways. To our friends in the North, who are celebrating Brigid, Oimelc, or Candelmas - may the first hopeful signs of Spring lighten your hearts, and the lengthening days assure you that the Great Renewal is certain. All bread-making is a Sacrament, whatever your spiritual tradition. Second only to childbirth in importance, it is the oldest and most vital of women's life-giving skills, and was once thought of as magical. 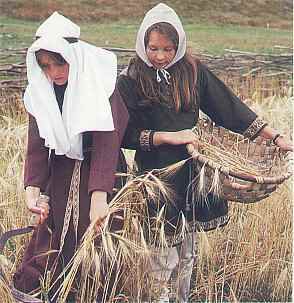 When you make bread, you connect with all women throughout the millenia, not just hundreds or thousands, but tens of thousands of years, back to the very beginning of human history. Current South Australian time - add 10hrs 30mins. to GMT. This may change the date, but not the Longitude (Sign). from Eddie Guscott in the UK. "A person of courage today is a person of Peace. The courage we need is to refuse authority, and to accept only personally responsible decisions." and put Reearthing website updates in the subject line.